The fifth episode of the story of India takes us to the time of the Renaissance in Europe, when India was the richest, most populous civilization in the world. Qutub Minar (Qutb Minar) in Delhi is an example of Indo-Islamic architecture and the world's largest minaret at nearly 236 feet high. 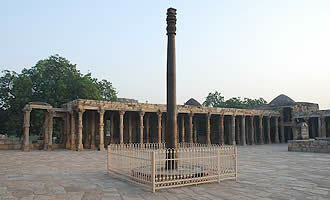 The first ruler of the Delhi Sultanate, Qutb-ud-Din Aybak, commissioned the column as a symbol of triumph in 1199. After Aybak died, while playing polo after just four years of rule, his successor added additional stories to the structure. A fifth and final story was added in the 14th century. Constructed out of red sandstone, quartzite, and marble, each of the minaret's stories has a different design theme. Koranic verses and the story of the tower's construction are inscribed on the structure. Below the towering minar is a mosque, Quwwatt-al-Islam ("Might of Islam"), also built in the early 12th century and constructed using pieces of more than 20 destroyed Hindu and Jain temples. The Qutab mosque and minar are Islam's oldest surviving monuments in India and part of the Qutub complex named a UNESCO World Heritage site in 1993. The focal point of the city of Madurai, the Meenakshi-Sundaresvara Temple is dedicated to two deities, Shiva (known locally as Sundareshvara) and Meenakshi (a form of Shiva's consort, Parvati), each with a separate shrine set within its own walled area inside the larger complex. According to legend, Meenakshi emerged from a sacrificial fire as a young girl in answer to the prayers of the childless Hindu Pandya king of Madurai, Malayadvaja. The king adopted the girl, but was concerned that she had three breasts. A divine voice told him that Meenakshi's extra breast would disappear after she met her rightful consort. Meenakshi grew up to become a fierce warrior and, during a skirmish against Shiva's armies at Mount Kailash, the god's Himalayan home, she saw him on the battlefield and immediately lost her third breast. Meenakshi recognized Shiva as her divine consort, as she was the incarnation of his wife, Parvati, and they were married. 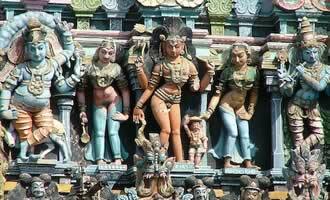 Together they ruled the Pandya kingdom and subsequently became the presiding deities of the Madurai temple. The immense, rectangular temple's layout is based on a mandala, a grid with concentric squares, surrounded by a high wall. Initially built by the city's Pandya king, Kulasekara, in the 13th century CE, the temple was badly damaged in the early fourteenth century following the establishment of Muslim rule in Madurai. 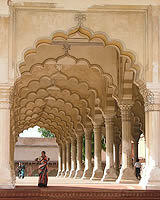 Most of the present complex dates from the 16th and 17th centuries, during the rule of the Nayak dynasty. Renowned for its enormity (843 feet by 787 feet) and design, the complex's main sanctums, to Shiva and Meenakshi, feature ancillary shrines and large, columned halls (mandapa), with one containing nearly 1,000 richly carved pillars. Other features include its numerous sculptures, 12 towered gateways (gopuras), and sacred tank, known as the Golden Lotus Tank, where devotees take baths before a puja (religious ritual). Qutb-ud-Din Aybak, a slave who rose to the rank of general under the command of the Afghan ruler Muhammad of Ghor, defeated the Chauhan Rajput king, Prithvi Raj, and captured Delhi in 1192. 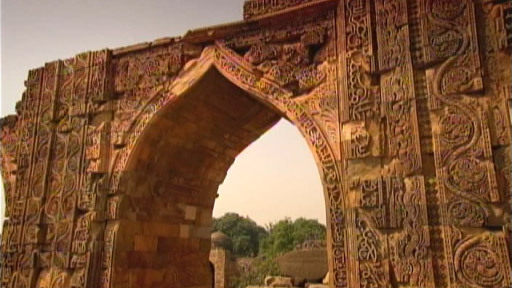 Following the death of Muhammad of Ghor in 1206, Qutb-ud-Din Aybak proclaimed himself Sultan of Delhi and established the Mamluk (or Slave) dynasty, the first of five successive dynasties with their capital in Delhi that collectively came to be known as the Delhi Sultanate. The four unrelated Turkish and Afghan dynasties that followed, including the Khaljis, the Tughluqs, the Sayyids, and the Lodis, ruled North India for more than 300 years, until 1526. The early sultanate dynasties introduced Persian language, literature, culture, law, as well as practical and agricultural innovations. Ethnic and linguistic pluralism marked this period, with Muslim rulers ruling over a primarily non-Muslim population. Cross-cultural influences can be seen in the tradition of Sufi devotionalism that informed and was informed by Indic bhakti devotion. By the 15th century, the sultanate had broken into a series of regional kingdoms. The sack of Delhi by Timur (or Tamerlane) in 1398 stripped the sultanate of most of its power. 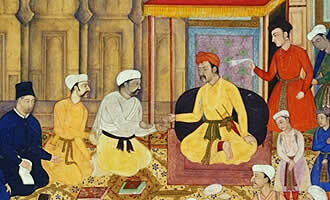 In 1526, the sultanate fell to Zahiruddin Muhammad Babur, the first emperor of the Mughal dynasty. Sikhism is a monotheistic faith that originated in India during the 15th century. Today, it has roughly 20 million adherents worldwide, the majority of whom live in the Punjab, in northwest India. It was founded by Guru Nanak, the first in a line of ten gurus (spiritual leaders) who developed and promulgated the faith. In Punjabi, the word "Sikh" means "disciple" and the faithful are those who follow the writings and teachings of the Ten Gurus, which are set down in the holy book, the "Adi Granth." 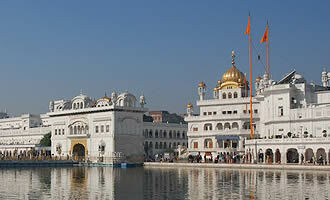 Sikhism synthesizes elements of both Islam and Hinduism into a distinct religious tradition. Like Islam, it emphasizes belief in only one God and similar to Hinduism, teaches that the karmic cycle of rebirths cannot be overcome unless you achieve oneness with God. For Sikhs, everyone is equal before God and a good life is achieved by remembering God at all times, being part of a community, serving others, living honestly, and rejecting blind rituals and superstitions. In the late 17th century the tenth guru, Gobind Singh, established a military brotherhood within Sikhism called the Khalsa (fraternity of the pure). Although not all Sikhs belong to the Khalsa, many obey its edict of wearing the five symbols of faith, the Five Ks: uncut hair (kesh), a wooden comb (kanga), a steel bracelet (kara), cotton undergarments (kachera), and a sword (kirpan). The turban worn by Sikh men is the most visible manifestation of their adherence to these principles. 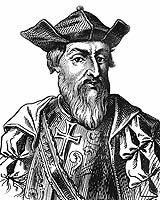 In 1498, Portuguese explorer Vasco da Gama arrived in Calicut, on the southwest coast of India, and became the first person to navigate a sea route from Europe to India, forever changing the world economy. Neither da Gama's proffered gifts nor his behavior (the Portuguese mistook the Hindus for Christians) impressed Calicut's leader, Saamoothirippadu (or Zamorin), and he refused to sign a trade treaty with the explorer. However, da Gama's successful voyage established Lisbon as the center of Europe's spice trade, a position Portugal would dominate for almost a century. In 1510, the Portuguese gained control of Goa, 400 miles north of Cochin on India’s west coast, and made it the hub of their maritime activities in the region. Da Gama would return to India two more times—in 1502 to violently avenge the deaths of Portuguese traders by bombarding Calicut, and as viceroy in 1524 to correct corruption among Portuguese authorities. On his last trip, da Gama died in Goa, where a town, Vasco, was named for him in 1543. In 1600, the British East India Company was chartered, and throughout the 17th century English, Dutch, and French traders traveled this sea route and established posts in India's port cities. The Mughal Empire was founded in 1526 CE, peaked around 1700 and steadily declined into the 19th century, severely weakened by conflicts over succession. Mughal rule began with Zahiruddin Muhammad Babur, who invaded northern India from his post in Kabul, and overthrew Ibrahim Lodi, the last of the Delhi sultans. At its height, the Mughal Empire included most of the Indian subcontinent and an estimated population of 100 million people. The empire's primary activities of war and expansion were supported by a strong central administrative and political system fully developed under Akbar, the third Mughal emperor. Under Akbar's rule (1556-1605), the empire expanded north to Kabul and Kashmir, east to Bengal and Orissa, south to Gujarat and southwest to Rajasthan. Establishing himself as a spiritual as well as military and strategic leader, Akbar promoted a policy of tolerance for all religions. His son, Jahangir (1605-27), and Jahangir's wife, Nur Jahan, who was highly influential in court politics, carried on Akbar's policies of centralized government and religious tolerance. India's economy grew under the Mughals as a result of the empire's strong infrastructure, expansion and trade with Europeans, who established bases in various Indian ports. Shah Jahan (1627–58), Jahangir's son, diverted wealth away from the military toward magnificent building projects including the Taj Mahal and a new capital city, Shajahanabad, site of a royal fortress and the largest mosque in India, the Jama Masjid. Shah Jahan's reign marked a turn toward a more Muslim-centered government, which his son Aurangzeb favored in contrast with his other son Dara Shikoh, who favored a more diverse court. After a two-year fight for succession that resulted in Shah Jahan's imprisonment and Dara's death, Aurangzeb (1658–1707) assumed the throne. He reversed many of Akbar's policies supporting religious tolerance, and Islamic religious law (sharia) became the foundation of Mughal government. By the late 17th century, the empire was in decline, weakened by succession conflicts, an entrenched war waged by Aurangzeb in the south, growing inequality between rich and poor and loss of support from nobles and gentry. By the mid-18th century, the once great Mughal Empire was confined to a small area around Delhi. Babur was the founder of the Mughal empire, and his successful raid into India in 1526 established what would become one of the most fabled dynasties in the history of the subcontinent and the world. Zahiruddin Muhammad, known as Babur, was a fierce warrior who was also noted for his love of music, gardens, and poetry. He chronicled his life and exploits in a personal memoir, the Babur-nama. A descendant of the legendary warrior-rulers Genghis Khan and Timur (Tamerlane), he was born in 1483 in the Ferghana region of Central Asia. Babur ascended the throne of his familial kingdom in 1494, following the death of his father, and his territorial ambitions remained focused on Central Asia, most notably the city of Samarkand, which he captured a few times but was never able to hold successfully. From his base in Kabul, which he gained in 1504, Babur turned his attention to the south and launched five different incursions into northwest India. In 1526, he finally succeeded in toppling the Sultan Ibrahim Lodi of Delhi at the pivotal Battle of Panipat. In the following two years, Babur expanded his territory in northern India by defeating the region's other major power, the Hindu Rajput kings. 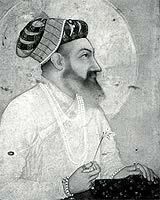 He died unexpectedly in 1530 and his empire passed onto to his son, Humayun, and his grandson, Akbar, who established the political and administrative framework for the Mughal Empire. On December 31, 1600, Queen Elizabeth I granted a charter to a group of 25 adventurers, giving them a monopoly on trade between England and the countries in the East Indies. The Company established settlements in Bombay, on India's west coast, and on India's east coast, in Calcutta and Madras. They became centers for Indian textiles that were in high demand in Europe, including cotton cloth, chintz, and calico. The company's two primary competitors in the region were the Dutch East India Company and the French Compagnie des Indes Orientales. Armies of Indians hired as soldiers and supplied with European weaponry increased the Company's might against its western competitors and were even used to control the courts of Indian princes. The decline and fall of the Mughal Empire in the mid-18th century contributed to the East India Company's accumulation of power in the region. 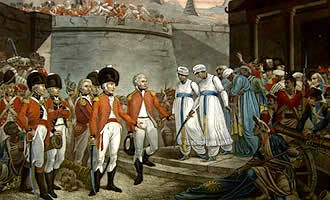 In 1757, the Company defeated and killed the Mughal governor of Bengal, Sirajud-Dawla, after he captured Calcutta in an attempt to hinder the Company from depriving merchants and the government of revenue. By 1765, the Company had acquired control of the revenue systems of Bengal, Orissa, and Bihar, on India's east coast, and became the largest territorial power in India. The India Act of 1784 gave Parliament control of the company's affairs in London, but the heads of the Company oversaw the governance of India. Parliament transferred the Company's power over administration of the Indian territories to the Crown in 1858 after the Great Rebellion of 1857, an uprising of Indian soldiers (sepoys) that was largely blamed on the Company's mismanagement of the territory. The main seat of Sikhism's religious authority, the Akal Takht (throne of the Timeless One) is located directly opposite the Golden Temple. The original structure, completed in 1609, was built by the sixth guru, Hargobind. The present-day structure, topped by a gilded dome, rises five stories and is inlaid with marble. The Akal Takht is also where the original "Adi Granth," the Sikh holy book, is stored each evening; it is transported to the Golden Temple every morning on a sumptuous palanquin. The building sustained heavy damage when the Indian Army raided the Golden Temple complex in June, 1984 during an uprising of a militant Sikh group pushing for independence for the Sikh Punjab. The oldest and most important of the five Takhts, or seats of authority, it is from here that issues confronting the faith or community (panth) are discussed and resolved; standards of social conduct and personal behavior are formulated; justice is meted out for those charged with violations of religious discipline; and the hukamnamas (edicts or writs), which are binding for all Sikhs, are issued. Guru Hargobind is believed to have issued the first hukamnana announcing the creation of the Akal Takht. Emperor Shah Jahan (1627-58), fifth ruler of the Mughal Empire, became the greatest patron of Indian architecture under the empire, funding magnificent building projects that expressed and celebrated the grandeur of his rule. The Taj Mahal is the most famous of Shah Jahan's projects and was commissioned as a monument and tomb for his beloved wife, Mumtaz Mahal, who died in 1631 while giving birth to their 14th child. Completed in 1648 and modeled after a paradise garden, the Taj Mahal also includes the largest inscription project of its time, with 25 quotations from the Koran about the Day of Judgment, divine mercy, and paradise depicted on its gate, mausoleum, and mosque. In 1983, the monument was named a UNESCO World Heritage site. Since 1996, excavations by the Archaeological Survey of India have revealed the existence of a lost "Moonlight Garden" mirroring the rectangular enclosure of the Taj on the other side of the river Yamuna: a project aided by the Sackler Gallery in Washington and paleo-botanists from the New York Botanical Garden. Among the magnificent works for which Shah Jahan is known, is the Peacock Throne constructed of gold and hundreds of rubies, emeralds, diamonds (including the famous Koh-i-Noor), and other precious stones. An extensive new capital city, constructed between 1639 and 1648, at Shajahanabad (present-day Old Delhi), included waterways, spacious squares, and bazaars. It was the site of a royal fortress, the Red Fort, and the largest mosque for its time, the Jama Masjid. Shah Jahan's reign ended in a two-year fight for succession between his sons Dara Shikoh and Aurangzeb that resulted in Shah Jahan's imprisonment, Dara's death by the orders of Aurangzeb, and Aurangzeb’s assumption of the Mughal throne. Also known as Chatrapati Shivaji Raje Bhosle, Shivaji (1630-1680) was a great Hindu patriot and war leader who founded the Maratha empire in western India in 1654 and who has become a great hero in post-Independence India, especially in the western state of Maharashtra. Today in Mumbai, India's commercial capital, both the main airport and the central railway station (the former Victoria Terminal) are named after him. Until recently, influenced by British imperial historiography, the Mughals have taken precedence in histories of 17th century India, but the Mughals even at their height only ruled northern India, and in recent years the importance of the Maratha state has been acknowledged. Shivaji was a great military leader who resisted the Mughals, a fort builder and state organizer who also promoted Sanskritic learning and the ethos of traditional Hindu religion and ethics as a bulwark against the Islamic culture of the Mughals. Battles in the 1660s and 70s against the Mughals led to Shivaji's coronation in 1674 using ancient Hindu rituals to emphasize his allegiance to the Hindu past. Nevertheless, Shivaji was tolerant of all religions (some estimate that thirty per cent of his army was Muslim) and was personally devoted to Sufi saints as well as to the Hindu pantheon. 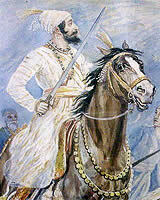 In this he forms a fascinating parallel to what rulers like Akbar were trying to do: in a letter to Aurangzeb, Shivaji suggests that Hindu and Muslim were simply "terms used by the True Divine Artist who blends his colors and fills in the outlines of His Creation" and states that the Muslim call to prayer and the Hindu temple bell were "both in remembrance of Him and both a yearning for Him alone." 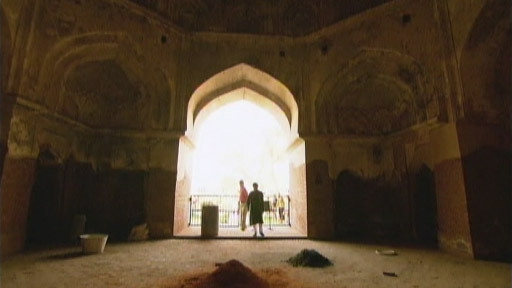 Video: The Taj Mahal, a monument to love ... and a mystic Sufi map? 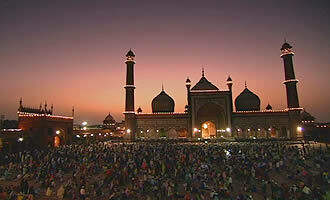 The Jama Masjid is the grand mosque of red sandstone and white marble located in the part of Delhi known as Old Delhi. The mosque and this section of the city, originally called Shahjahanabad, were constructed during the reign of the fifth Mughal emperor, Shah Jahan. The Jama Masjid was designed by the architect Ustad Khalil and completed in a span of six years, from 1650 to 1656. It's situated on a rocky outcrop with three monumental, arched gateways—on the north, south, and east—atop a towering flight of broad stairs. Beyond the mosque's entrance is the immense open courtyard that can hold more than 20,000 people and is surrounded by an arcade with a chattri (domed kiosk) at each corner. The massive prayer hall, oriented toward Mecca, sits at the west end of the courtyard, while a pool for ablutions is located at its center. Three large white marble domes, with black vertical stripes, top the hall and its central doorway is flanked on each side by five cusped archways, above which are panels inscribed with praise for the building and Shah Jahan. At each corner of the hall's façade is a 130 foot, three-story minaret of red sandstone with vertical stripes of white marble. 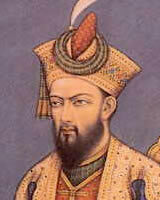 Aurangzeb (1618-1707) was the third son of Mughal emperor, Shah Jahan. After a false report spread through the empire that Shah Jahan had died, Aurangzeb embarked on a brutal power struggle with his three brothers, including Dara Shikoh, which he won in 1659 to become the sixth ruler of the Mughal Empire. He imprisoned his father Shah Jahan for eight years; the old emperor died in captivity. A deeply pious man, Aurangzeb practiced a much more orthodox form of Islam than his father, and was fundamentally intolerant of the Hindu religions. He ushered in a number of anti-Hindu policies, such as the jizya, a tax on non-Muslims, and imposed higher customs duties for Hindus than for Muslims. Worse still, he reversed the policies of Akbar the Great, demolishing many Hindu temples; he also persecuted the Sikhs, executing their ninth guru, prompting the Sikhs to form an "Army of the Pure" (Khalsa) to protect themselves. The transformation of the Sikhs into a militant order dates above all from his time. Aurangzeb expanded the Mughal Empire, conquering additional territories in southern India, but his policies created great unrest within his empire. He was continually forced to put down rebellions from a group of Hindu warrior clans called the Marathas, led by the charismatic Hindu leader Shivaji Bhosle, who practiced guerrilla tactics and eventually formed a new Hindu kingdom. After Aurangzeb's death in 1707 CE, the Marathan Kingdom continued to grow, ultimately forming the Marathan Empire. Aurangzeb meanwhile had left four sons, who battled among themselves for power; the wars that he had fought left the treasury empty, which contributed to the Mughal Empire's slow decline, and eventually to its feeble capitulation to the British.